Stars: Jamie Kennedy, Maria Menounos, Miguel A. Núñez Jr.
Chip Imitation: Heh heh, it started out where she was wearin' a lot of clothes. Then she wasn't wearin' a lot of clothes, then BOOM! I got a chubby! Q: What are the differences between the theatrical version and the Unrated version of the movie? Not a complete disaster! Can be enjoyable if you are in the right mood! 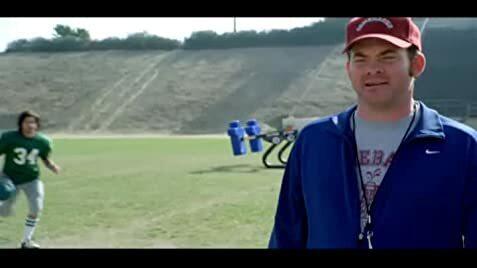 It was only a matter of time that a spoof would be made of sports movies! And there are plenty of movies to be spotted which are made fun off. But the biggest problem I had was the fact that it stays with recognizing movies. The director and writers of "The Comebacks" somehow forget to get creative. 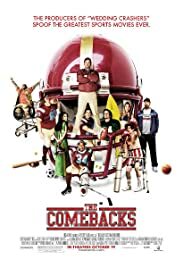 While I must admit that I laughed at certain scenes,"The Comebacks" could have been so much funnier. The actors forget to deliver their lines seriously and have a straight face throughout the movie. A spoof demands this and that is the main reason why silly jokes work in movies like this. Because of the failure of the cast to do so the jokes never hit their mark. Some scenes take forever and normally in spoofs that doesn't have to be a problem. Take "Naked Gun" for instance. Their is always something happening on screen. In "The Comebacks" they didn't even bother to let stuff happening in the background. Only a couple of factors make this movie worth watching! It still is fun to spot the movies that are made fun off. And Jermaine Williams as Ipod. His parody on Cuba Gooding Jr. as Radio was hilarious! He seemed to be the only one in the cast to get the idea of what a spoof is about. Not entirely bad!